Back in the eighties, pop music was becoming very electronic with musical gadgetry and a manufactured sound that was cookie-cutter. Songs would sound the same and artists strayed from their musical roots in order to create radio-friendly pop hits. But, one such band try bringing back the rockabilly roots of the fifties into this electronic decade of music. The band was The Kingbees and to celebrate the 35th anniversary of the band's self-titled debut album, Omnivore Recordings is re-released it on April 28th with eight previously unreleased bonus tracks. The original ten song album begins with the soda shop-hop, Buddy Holly rock 'n' roll of "Sweet Sweet Girl To Me." Their music feels very timeless, especially with their first single "My Mistake," which carries a Californian vibe and steady rhythm that keeps the energy high along with an amazing Jamie James guitar solo. The surf guitar intro of "No Respect" and post-punk energy of "Fast Girls" shows that The Kingbees were looking to notch their own branch in the rock music tree. The eight additional recordings included on this disc features the band's original five-song demo and three live songs from the tour the followed the album's release. The demo songs have a bit of a more raw feel to them, while there is not much of a difference between the released version and the demo version. One song that did not appear on the album that was on their demo tape with the rockabilly fueled, fifties fun romp of "Burnin' The Town Tonight." The three live songs are The Kingbees' spot on covers of "Something Else," "Not Fade Away" and "Bo Diddley." 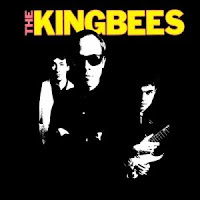 To find out more about this re-issue of the debut album from The Kingbees, please visit omnivorerecordings.com.